Today, I am going to talk about something I recently learned on a 10 hour car trip to Disney World, tips on keeping kids amused while traveling. If you haven’t already, check out my Disney tips and tricks post.I must say I applaud my parents, and all parents in the pre-Ipad era. I have no idea how they did it! Luckily for parents nowadays we have some help when keeping our kids amused during travel. You can use these tips on keeping kids amused while traveling for car trips, plane rides, train rides, and more! 1. Technology is your friend! 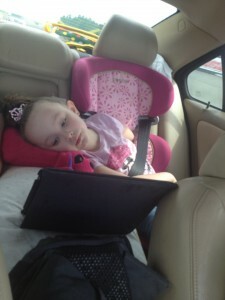 Personally, we bought Jaiden (5) an itunes gift card and let her pick out a brand new movie to download for the trip. (She picked Wreck it Ralph, which was fantastic, btw) Ipads, tablets, kindles, and phones are great ways to keep the peace in the back seat. Esp with siblings. Just make sure they have games,books, and movies that don’t require wifi! 2.Travel Games- This is an oldie, but a goodie. Car rides will go by much faster by playing fun games while on the road. You can find books at walmart, or even print out your own online. Check out the About.com section on traveling with kids for some awesome print out games. 3.Coloring Books! What kid doesn’t like to color!? Coloring books are a great way to keep kids entertained. I also suggest getting a lap desk for the kids to color on so you don’t have frustration from kids everytime you go over a bump. (or crayons all over your car!) Amazon has an awesome Kids lap desk. It’s only $14.99 and it even has side pockets for crayons that aren’t in use. 4.Leave at night! My husband works night, so we waited until he got home (about 1 in the morning) and left for Disney then. It was a fantastic idea! My little one got to hop in the car with her favorite teddy, and we all wore our Pjs. She thought that was super cool (and comfy!) We packed a midnight snack, listened to some soothing music, and she got over the excitement about an hour into the trip and slept until we were only about 4 hours away! 5.Make sure to take breaks! I know a long drive is bad enough, knowing that it’s going to take 10 hours to get somewhere. Most of us are just thinking drive fast, and get there! As adults this is a lot easier to do than kids! I think the fact that we made some small stops along the way really made the drive more pleasant for everyone! Do some research and find out if there is a fun rest stops, or local hot spots on your way (to and from!) and take an extra 30 mins to make a stop. We made sure to stop on our way (from Tennessee to Florida) in Georgia and get some peaches, and to stop in Florida at a local gator farm! It will let everyone get out of the car and stretch their legs, and also get a little space between everyone too. Trust me, it will make a world of difference. Ok now it’s your turn! What are some of your tips on keeping kids amused while traveling? As parents we have to stick together and help each other out! What tips have helped your family out during traveling? Leave them in the comment section below!